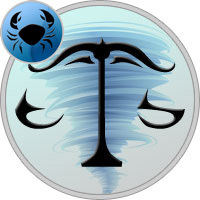 Libra and Cancer belong to the difficult to combine in nature elements — air and water, respectively. Their union is difficult to call harmonious, since signs rarely can achieve spiritual intimacy. Relations between them are more likely in the business sphere, where there is some benefit for both. In their alliance, the unofficial leader is Libra: they are charming, pretty and friendly. Venus, leading them, awarded them with soft energy, courtesy and diplomacy. These qualities help the air element successfully manipulate others. This is the same example in which a person achieves all sorts of goals without applying a single drop of aggression. Cancers are very sensitive and fearful by nature. The Ward of the Moon is able to change his mood several times a day, as he reacts sharply to what is happening around and takes everything to heart. Libra is smart, they feel that the partner is emotionally unstable and enjoy using it in a relationship with him. The sign of water is very cautious, neat and long looks at people before letting them close. And if he let him in, he clamps his partner tightly and considers him his own, in a sense even falls into dependence on him. And how not to believe such a good-hearted woman as Libra? Compatibility of Libra and Cancer is at a low level due to their different perceptions of life, temperaments and values. Libra is always on the move: they like to learn everything new, their intellectual sphere is very developed. By the way, in others they mostly value brains, because with an intelligent and erudite partner, there is something to talk about and what to do. They dream a lot, build grandiose plans, the truth, most of which are never realized for the reason that there are too many dreams, and they replace each other quickly and often. Libra loves freedom, creative flight and dream of self-realization. They need constant changes, new impressions and emotions. Cancers, by contrast, tend to be stable and stable. They can have fun and relaxed company of friends, and then come home and, wrapped in a warm blanket, will long shed tears about the imperfections of the world and feel sorry for themselves. Horoscope of Libra compatibility with Cancer does not promise them bright prospects in the relationship, as they are too different. Fearful Cancer painfully perceives any changes that the partner needs so much. And since the air element is unpredictable a priori, the representative of the Moon, accustomed to control everything and everyone for the sake of his safety, will always be dissatisfied with his behavior. His eternal lamentations will irritate the optimistic-minded Libra. The compatibility of Libra and Cancer in work is very low due to their differing worldviews. Working on the same project together, they are waiting for a lot of difficulties and disagreements. Both love to dream, so occasionally they stay away from work. But Cancer always returns to the task and completes it qualitatively and to the end. But the partner, having burnt out or finding work boring, can simply throw it. The representative of the water element is serious about even trifles, the partner is more superficial and can work through the sleeves. Further, both signs refer to fixed, so if their opinions suddenly disperse, then the partners can stand upright and in principle not yield to a colleague. All work will stand still. Compatibility of Libra with Cancer in friendship also leaves much to be desired. The air element will be boring next to such a timid friend who sees everywhere a dirty trick and danger, does not like noisy activities and prefers to spend his free time at home in front of the TV. Libra needs communication, and only people can give it, so it seeks to accumulate them. They can be good friends, who occasionally meet, talk about something interesting and again part for an indefinite period. They will be just acquaintances, not bound by any ties or obligations. Both signs are romantic and emotionally sensitive. At first this fact will bring them very close. They will walk until the morning, cry together while watching romantic melodramas and talk for hours on the phone. Compatibility of Libra and Cancer in love in the first stage of the relationship is very favorable for both. But soon the fog of euphoria will dissipate, and the partners will see each other in real light. A long and difficult interpersonal lapping will begin, entailing mutual quibbles and conflicts. Cancers need specificity, stability, a partner can promise one thing, but act differently. In addition, Libra is in constant doubt, and this is more than enough to frighten off the ward of the Moon, because in the satellite he is looking for hardness and security. But, despite its indecision, the representative of Venus has good foresight and knows how to make good plans. If Cancer understands this and will help the partner, push him and support in the implementation of the plan, then they will be able to build a successful union. Although the basis for it will be more business partnership, rather than the proximity of souls or unconditional trust. Libra, in turn, can also see the usefulness of Cancer as a life partner, and will want to keep him next to him for personal gain. Thus, the compatibility of Libra with Cancer in a relationship is beneficial to both partners. But maybe it’s for the best? After all, on one romance you will not go far: you can not put it in your pocket and you will not smear bread on it. But the compatibility of Libra and Cancer in bed promises to be very favorable. Partners are gentle and sensual lovers, paying enough attention to the needs of the partner. They love beautiful courtship and long foreplay, taking place in a romantic setting. Both want to enjoy the sensations and emotions that they receive during mutual caresses, so no one is in a hurry to proceed to the very physical act. Signs tend to fantasize and experiment. But the secretive Cancer to agree to this only within the bedroom and then not always, but more relaxed Libra does not mind making love in the most unexpected places, enjoying the acuteness of new feelings. Above this distinction they will have to work, the air sign will certainly want to carry conservative Cancer, which he can resist for a long time. Cancer is a sad and hypochondriac sign, his partner — on the contrary, full of joy and optimism. On the one hand, such a difference can irritate partners, but on the other, it will benefit both. Cancers will learn to have fun, to look at life more positively. And the air element will be more often lowered to the ground and looking at the world more responsibly. The material side of life will also cause contradictions between them: the sign of water is inclined to earn and save, the partner loves to let money into the wind, both his own and his wife. The level of compatibility of Libra with Cancer in a marriage will depend on how they look at the shortcomings of each other. It will be a long time before the spouses get used to each other and learn how to properly deal with the characteristics of another. They will have many trials, which will result in the ability to make concessions and mutual compromises. Thus, compatibility of Libra and Cancer in family life is possible provided that the spouses experience mutual, deep and real feelings, and also have a sincere desire to be together. Stars all give chances of love, and who and how they use it — depends on the signs themselves. The quality of the union will also depend on the personal horoscopes of partners and natal charts. In the best possible way, the spouses will be able to build strong relationships in which they will have common goals and go to them, using their such different opportunities.